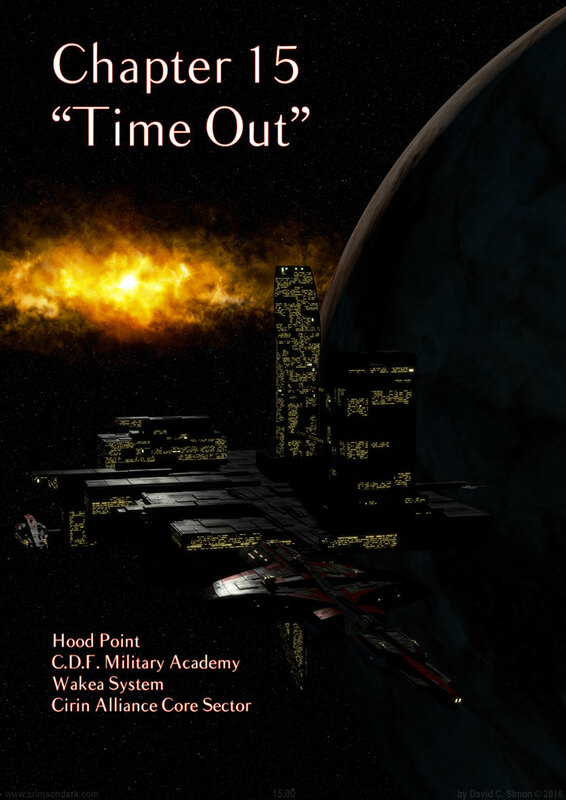 My tradition has been to name space stations after Sci-Fi writers, and Hood Point is no exception. Hall Hood is a writer at BioWare Austin, working on Star Wars: The Old Republic. I was a nervous wreck for much of my time at BioWare (not their fault), but many of my fellow writers, and Hall especially, went out of their way to make me feel comfortable and welcome. Not only is Hall an incredibly talented and intelligent writer with a great ear for dialogue, he's also a super-cool guy and the best friend anyone could hope for. Better still, I know he reads Crimson Dark, so hi Hall! Thanks for reading! Chapter 15 is the official start of Volume 2, though the one-shot can be viewed as the unofficial prologue. What's that, I hear? You want a wallpaper of this space station? Good news! For only $2 per month, you can get exactly that (and more) over at CD's official Patreon page!